Rating: 4/5 – What if God was one of us? Clive Barker’s name is synonymous with horror. He has penned countless horror stories that have helped define the genre. Some were turned into mainstream horror movies such as Hellraiser and Candyman. One of the mediums within writing that Barker has not explored greatly is comic books. Boom! 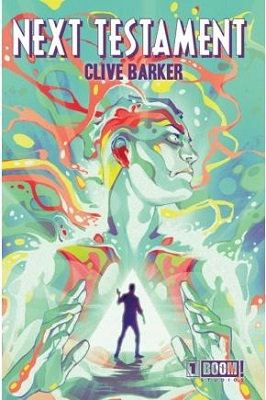 Studios release for Clive Barker’s Next Testament promotes the book as “the first original comic series created and written by Clive Barker.” If this is the level of storytelling we can expect from him, then I hope that we see much more of Clive Barker in the comic book world. Clive Barker’s Next Testament is written by Clive Barker and Mark Miller with full art chores handled by Haemi Jang. Let me start by saying, I like stories that challenge me as a reader. Don’t get me wrong, there is still that eight year old comic reader in me that enjoys a good old fashioned superhero battle, but as I have gotten older I have learned to appreciate the subtleties that writers and artists place in their books. Clive Barker’s Next Testament is one of those books. You read it, then you realize after putting it down that you barely scratched the surface. Then you go to work and you continue thinking about the book until you can get home and read it again. Boom! (pun intended) it hits you, like the final scene in Usual Suspects when you start piecing it all together, the little things the creators did to layer the story and breathe life into it. The issue starts with a simple statement: “A single dream can spark a revolution” and from there we are off and running, literally, in the desert following our main character Julian Demond as he races blindly towards a goal following a dream he just had. He finds Wick, a God who calls himself the Father of Colors. Jang did a nice job with the coloring here as Wick is dripping with a rainbow assortment of colors that looks similar to a child who mashes all their Play-Doh together into one colorful mass. The creative team has littered the book with deeper meanings and symbolism, from the quote from a Russian philosopher, to the book used to hide Julian’s secret office, to the statement on the final page by Wick. Clive Barker’s Next Testament is not perfect, but it does what a first issue is supposed to do. It creates a world that pulls you in, makes you think, question things and wonder what is going to happen to these characters. If you are looking for a book that is a little different than what you typically see on the shelf and one that will give you a layered reading experience, then give Clive Barker’s Next Testament #1 a try. I am glad I did. This entry was posted in Boom! and tagged Boom! Studios, Clive Barker, Next Testament. Bookmark the permalink.